Robo-advisors have been great for getting more people to dip their toes in the stock market through low-cost, automated investment opportunities. What you get with a robo-advisor is a portfolio assembled with your needs in mind, but with an algorithm at the wheel. Granted, those algorithms were built by, and are managed by, financial professionals. But it’s the computer intervention that allows you access to professional advice for so much less. Here’s what to keep in mind when going robo. There’s an ongoing debate of whether robo-advisors can really act as fiduciaries—that is to say, what their legal obligations are to act in their clients’ best interests. A lower standard, suitability, which allows brokers (for example) to sell you a financial product that’s merely suitable for your needs. Then there’s fiduciary advice, which comes with higher standards. Not only is the advice suitable, but it’s also in your best interest. The Securities and Exchange Commission recognizes robo-advisors as fiduciaries, but it also urges them to be transparent with how their algorithms recommend portfolios. And it stresses the importance of them really getting to know their customers through their questionnaires. Are you looking to buy a car in the next five years? A house in ten? Or are you thinking more long-term, with retirement and your children’s educations in mind? Identify your goal and time horizon, because what you want to accomplish with your money, and when, should go into determining how conservative or aggressive your risk profile is—and how you answer your robo’s questionnaire. Most robo-advisors will take these needs into account, and attempt to nudge you to make the right asset allocation decisions for your needs. But they don’t all do it in exactly the same way. “If you’re saving for your kid’s college, we’ll give you a recommendation—we call them risk tolerance bands—and you can deviate a few points up or down,” says Nick Holeman, a CFP with Betterment (which originally launched as a pure robo-advisor, but has since added humans to its offerings). “If we recommend 50% stock and you choose 55%, because you’re riskier, we’ll let you. Trout says the limited range of assets offered by robo-advisors, in general, is reason enough to be sure you’re not keeping all of your eggs in the robo-basket. “You want to spread your assets across different types of investments, not just the stocks and securities held with robo-advisors,” he says. “The diversification provided by robo-advisors isn’t super powerful.” While robo-advisors provide exposure to the broad stock market, even with rebalancing and tax-loss harvesting, you’re at risk of losing money. That’s why you want to diversify your types of investments across different asset classes, which means also having your money in cash, real estate and perhaps commodities. Last year, Betterment suspended trading during the “Brexit” market volatility to prevent its customers from making impulsive decisions with their money—a move CEO Jon Stein went on record saying was a good one to make. For the most part, robos are self-driving vehicles that allow you to grab the wheel when you want to steer it in a different direction. With this move, Betterment deployed the airbags, completely immobilizing their investors. “Communication could have been clearer,” says Betterment spokesperson Arielle Sobel. The ways many robo-advisors (including Betterment) mitigate downturns is something to consider, as well. When the market falls, many robo-advisors will automatically rebalance your portfolio and employ tax loss harvesting. “Those strategies help use downturns to your advantage to correct your portfolio… But there’s no way to prevent losses,” says Holeman. If in these times of market distress you want to engage and give input, then a robo might not be the right tool for you. Do I want someone to just manage my money, or do I want to be able to talk about my money, too? 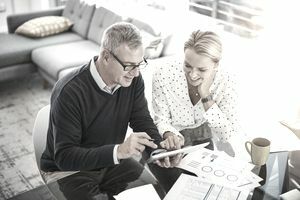 Do I want an investment management tool, or do I want an investment management tool and a financial planning relationship? It may sound counterintuitive but think of answering the questions emotionally, rather than logically. For example, if the market goes down, you might understand it’s a buying opportunity, but if the thought of the market going down gets your adrenaline pumping (and not in a good way), then that’s something you need to address. How Can I Benefit From Investing in Blend Funds? Is It Enough to Save, or Should I Start Investing, Too? Should I Have Short-Term or Long Term Investments? Are CDs a Good Place to Put Your Money? How Much Do I Need to Make Before I Need to Worry About Saving Money? Help! Should I Buy Stocks or Mutual Funds? How Much Money Should You Save Each Month? Is It a Good Idea to Use the Financial Advisor Through Your Bank? Should I Change My Investing Strategy During a Slow Economy?